Following a pitch inspection today the referee considers the pitch waterlogged in certain areas. Despite the fantastic number of volunteers who have worked tirelessly all morning, two areas of the pitch were considered unfit to play. 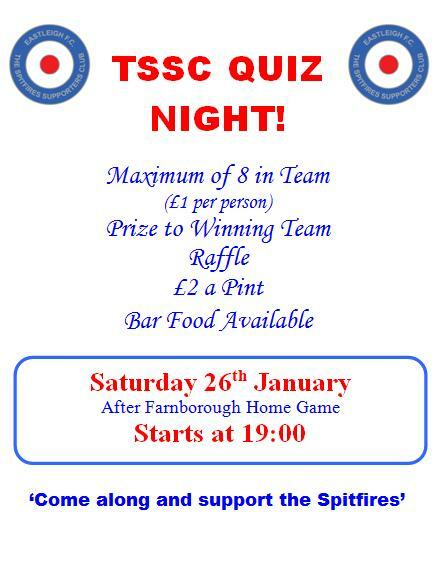 The Christmas raffle will now be postponed until Saturday 26th January for the home Blue Square Bet South fixture against Farnborough. Please return your sold and unsold raffle books to the club as soon as possible. Referee Chris Powell inspected the pitch at 9.30 today but had to call the game off an hour later, despite the valiant efforts of the supporters and ground staff. EASTLEIGH boss Richard Hill has stressed that the club's latest move towards full-time football will be built around first-team players. The Blue Square Bet South outfit have twice gone down the road of daytime training before, most recently at the start of last season. On that occasion it was mainly youngsters involved as part of the club's player development programme. But this time Hill will be working exclusively with the first-team squad as the Spitfires look to follow league leaders Salisbury City down the full-time professional path. "This is a first-team squad thing," stressed Hill. "We're not just going to bring players along to make up the numbers because that would dilute the quality. "We had two young players involved in our first session on Tuesday, Corey King and Cassius Newton, but both have been involved with first-team training for a month. "This is all about trying to take the first team squad forward. Eastleigh Football Club would like to provide the following update regarding the potential purchase of the stadium. An offer had previously been made to the board at ‘Ten Acre Holdings’ (the current owners) which was considered to be worth presenting to the shareholders yesterday in a board meeting for their consideration. Following discussions the board of TAH felt that they were willing to accept the offer presented to them as long as the remaining shareholders also felt a desire to sell the ground at this stage. On this basis a full shareholders meeting was called and the outcome was that a clear large majority were in favour of accepting the offer and that the sale of the freehold should progress. Eastleigh are delighted to announce taking Portsmouth’s promising young defender Alex Grant on loan for one month. Spitfire manager Richard Hill said: “Portsmouth let it be known Alex was available and I felt a player of his potential with first team experience already, it would be an ideal situation to bring strength into the defensive area of the pitch. “I have no control over what comes out of the sky but with a busy Christmas period and 8 games in January, all again weather permitting, I feel Alex will be a very useful addition to our squad”. Grant was born in Manchester and lived in Salford for seven years where he played football for junior team Deans F C, the same side as Manchester United’s Ryan Giggs. The 18 year old signed a two year scholarship with Portsmouth in July 2010 and has progressed through the reserve and academy sides, appearing for the first team on the bench against Nottingham Forest in April 2012. Eastleigh FC have today won the race to sign Dominican international striker Richard Pacquette on a free transfer. The former Queens Park Rangers and Havant & Waterlooville hit-man has agreed terms at the Silverlake Stadium, following his release from fellow Blue Square Bet South side Bromley earlier this week and will be a good addition to the Spitfire’s squad. The London born 29 year old has a reputation as an experienced front-man who scores goals at all levels of football and will be available for selection for this weekend’s fixture at home to Billericay Town. 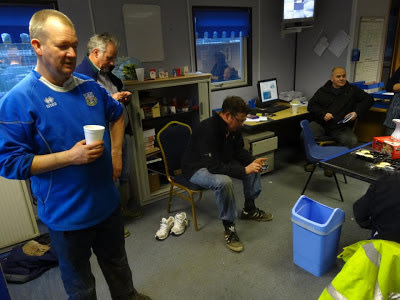 In other news, the much delayed Truro City fixture, postponed for a third time already, has been rescheduled for Tuesday 22nd January 2013. Likewise, our eagerly anticipated Hampshire Senior Cup Quarter Final against AFC Bournemouth has been scheduled for the 29th January 2013 where we get an opportunity to defend our title we won at St Mary’s in May. Eastleigh drew their third successive away blank – in terms of points and goals - at Dover’s Crabble Athletic Ground, but the final result told little of a display that was much improved on those at Eastbourne Borough and Hornchurch. The Spitfires second-half performance, when they admirably refused to take a backwards step despite playing with ten men, exhibited exactly the type of spirit we’ve been longing for on some of the fruitless trips this season. With Jai Reason and Michael Green both deemed fit enough only for places on the bench the Spitfires starting eleven was missing two of this seasons integral parts. Richard Hill opted to line-up with a three man central defence – comprising; Mitchell Nelson, Tom Jordan and Leigh Mills – having adopted a similar formation in the Hampshire Cup tie against the vastly inferior Fleet Spurs on Tuesday night. Promising youngsters David ‘DJ’ Whittaker and Joe Chamberlain have joined Winchester City on loan for one month. Talented midfielder DJ, who has two first team appearances this year and versatile defender/midfielder Joe will team up with Winchester boss James Taylor as part of their continued development. Experienced goalkeeper Ross Flitney has returned to the Silverlake after the Spitfires and League 2 side Gillingham agreed a one month loan deal. Ross first joined Eastleigh on loan in October, making five first team appearances including an impressive performance and clean sheet in a victory against Sutton United. He was recalled last month by the Gill’s as cover, however, having concluded the paperwork is available for selection for Richard Hill’s side in this weekend’s away fixture at Dover Athletic. Ross came through the youth ranks at Arsenal before moving to Fulham in 2003, working with senior keepers including Edwin van der Sar and Mark Crossley. With spells at Brighton, Barnet, Grays, Croydon and Dover, the 28 year old shot stopper joined the Gills in July 2011 making his debut against Cheltenham Town. Eastleigh's run of five games unbeaten at home in the Blue Square Bet South came to an end at the hands of Jamie Day's 2nd-placed Welling United. Eastleigh looked good value for their 1-0 lead at half time but the visitors hit back strongly after the break to score three times and claim all of the points despite controversy surrounding their second. Coming in to the game the visitors were in a rich vein of form with 13 points from their last 6 league games. The Spitfires had lost their previous two matches - in the FA Trophy versus Hayes & Yeading United (1-4) and away in the league at AFC Hornchurch (0-1). Due to not having a game for a couple of weeks, Richard Hill's side got in a friendly at Romsey Town in midweek where the Spitfires won 4-0 courtesy of a Jai Reason hat trick and a goal from Craig McAllister.